YULA currently offers a structured, spiral curriculum in Torah Studies designed to provide students with exposure to the classical Jewish sources through textual study and to engender a life-long love of learning. New students are assigned to a class based on their proficiency and motivation. During their high school career students are monitored ensuring that their individual program suits their needs. Transfer between tracks is possible throughout high school. All students at YULA have, as their most basic Judaic course, the study of Talmud. Beginning with an introduction to Talmudic analysis in the 9th grade, the program culminates in a full Iyun class in the 12th grade which prepares them for study at a post-high school program in Israel. 9th and 10th grades emphasize the study of Tanach by mastering textual study with the classic commentaries. As they progress through their high school years, the methodology and range of commentaries to which they are exposed gains in sophistication and depth. The Baum Family AGT (Advanced Gemara Track) provides students with an intensive exposure to Talmud and its commentaries. 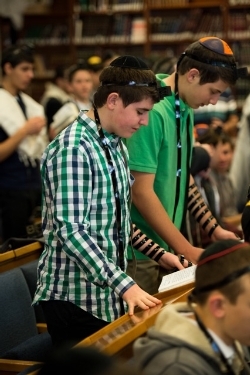 Beginning in 9th grade, the day includes a double period of Talmud with an emphasis on reading-skill technique and students are introduced to the traditional chavruta method of study. Each year, beyond their morning Talmud studies, during their extra course hours (Tuesday evening, Thursday evening and Sunday morning) the AGT students complete an entire tractate of Talmud in "Bekiut" study, gaining reading skills and familiarity with the text. In addition, the AGT students complete an entire seder of Mishnah as well as having classes in Dinim and Tanach. Any student may apply for admission to the AGT.